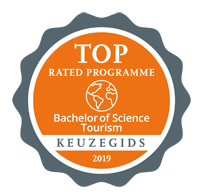 Keuzegids Universiteiten 2019 is the most important independent league table which assesses and compares the quality of academic programmes in the Netherlands, thus helping students to make informed choices about where to study. Degree programmes are ranked on the basis of various criteria, such as academic success, curriculum content, the quality of lecturers and educational facilities, and preparation for a career in the field in which students wish to graduate. Read more about the programme: Bachelor of Science Tourism.